For poor people, securing housing has meant a lifetime investment. Traditionally, slum dwellers have -partially or completely- solved their housing needs by themselves. Mainly, by collective effort. With time, the role of the government and the poor communities has changed. The gradual enforcement of governance arrangements and a generalized pressure to horizontalize the relations among city stakeholders, has allowed to find common ground between these two actors and with its larger network. 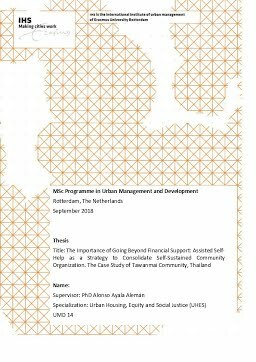 In the case of Thailand, this rearrangement has led to a deep reflection of how housing provision should be solved and what is the role of the poor communities. The Baan Mankong Program has gone beyond financial and technical support. Furthermore, it has focused in building the dwellers’ capacities for them to become the drivers of the process. This innovative approach has not come easy; it has been accompanied by an integral support system based on trust between the government, the communities and the other city stakeholders. For practical terms, it means that the government is willing to transfer part of its decision power in favor of a multi-stakeholder arrangement. This thesis is structured in five chapters. The first chapter, introduces the topic. (1) It refers to the challenges that one-side solution to address housing needs has had in the past; (2) introduces the current debate of the potential housing provision has in being a driver force in social transformation; and, (3) presents the aims of the thesis, which is, to understand how an integral support of the government ensure the long-term consolidation of community organization. Chapter two, presents a theoretical review for this investigation. It situates the research as part of a historical discussion regarding the Self-Help School of Thought and, the contemporary concepts that that calls for a revaluation of this approach. Concepts such as: governance, network management, cooperative model, collaborative management and leadership are taken into consideration. Chapter tree, refers to the research design. It is a single case study based on qualitative data three level interviews and focus group; government, network and community. It targets Tawanmai Community, one of the Baan Mankong Program pilot projects in the North-East Thai Region. The community signed up to the Program in 2004, finished its construction process on 2007, and will complete the repayment of the government loan by 2020. The span of time in this project allows the researcher to assess if, under this approach, is possible to consolidate community organization over time. Chapter four, presents the findings of the research, divided in two main sections. The first one, the external factors, which accounts for the external support the communities received from the government and an extended network to consolidate the housing provision. The second one, internal factors, refers to the internal transformation that the community went through as they became the managers and responsible party for the success of the Program. Finally, chapter five, accounts for the conclusions based on the findings and its reflection with the literature review. Namely, the importance of refocusing the strategies of housing provision from material outcomes to community capacity building.